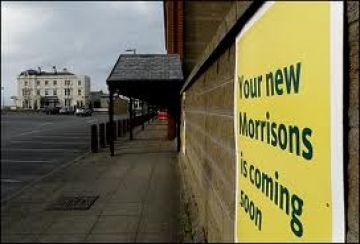 Contractors working for expanding supermarket chain, Morrisons, have recently been supplied with 6,500 metres of Siberian Larch for exterior cladding their new store at Littlehampton on the South Coast. The new outlet is situated on the site of the previous Body Shop HQ and involves the re-development of an existing warehouse. The modern design incoporates sustainability through energy efficiency and the use of sustainable materials. The larch was machined to the customer's own chosen profile in our modern milling facility, then packed and transported from our premises in North East Lincolnshire to West Sussex where it is currently being installed on site.